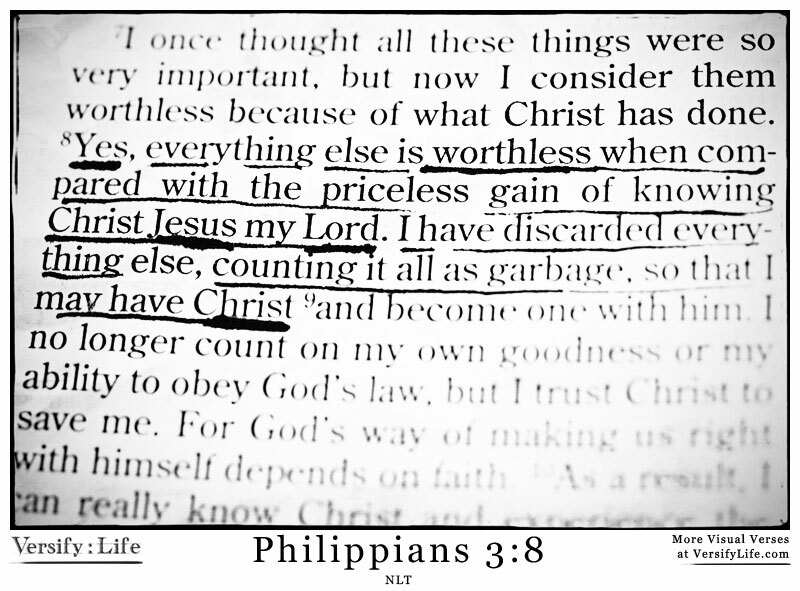 There are times in life where I feel like yelling at God, ‘STOP LOVING ME SO MUCH!’ To add to that thought, Paul’s words in Philippians 3:2-12 drive me insane! If I can be even more transparent, selfishly, I would rather live a comfortable life that is not affected by pain, turmoil, loss or defeat. Nobody enjoys trials. Nobody stands and says, ‘Bring it on LIFE!’ Nobody desires to be faced with one difficult circumstance after another! Paul goes on to describe everything he has accomplished – his historical background, vocational achievements, and family heritage. He had the perfect credentials of a Jewish man! Then we pick up in verse 7 and see a completely different perspective of how Paul viewed his own success. Reading these words hurts… Honestly – it cuts right to the heart of our humanistic view of success, comfort, knowledge, and prosperity. After saying ‘I am better at life than you,’ Paul comes out and says, ‘none of it is worth anything. In fact, I would rather suffer my way through life with Christ than to succeed based nf my own doing. Paul takes it a step further and says, ‘I am willing to give everything up for the cause of Christ, including my own life.’ The concept of suffering until the point of death rattles my brain and rocks my world. It doesn’t make sense and honestly doesn’t put a smile on my face. I don’t want to suffer; I want to be comfortable! And then I remember how incredibly powerful and gracious God’s love is for me, and also how incompetent I am when I fail to actively seek God’s face. As a prideful human, I must allow God to pick me, flip me upside down, and shake the craziness out of me! I must not wallow in my trials, but through God’s strength, overcome them. My purpose in life is to become more like Him – even to the point of willingly giving up everything for His sake! My prayer is to become content with being uncomfortable. I don’t know why God puts up with me. I will never fully comprehend His love, grace, mercy, and faithfulness. I can only trust and believe in who He says He is. I have seen God at work in ways that doesn’t add up or make sense. I know His love for me is real, unconditional, and without limits! His desire is to see me become more like Him every day. The challenging part of this takes place in the midst of suffering. Even though God’s love for us can cover a multitude of sin and He is powerful enough to take us through anything, when we give our lives to Christ, we are guaranteed to face moments of difficulty. Often times, the more we experience His love, the tougher life becomes. Yet, this is often when we experience the most growth. These are the moments we truly see how much Jesus cares for us individually and incredible His love is! How are you seeking to know Christ and the power of His resurrection – sharing in His sufferings? How are you being challenged spiritually? Are you relying on the power of the Holy Spirit and the love of Christ to get you through every circumstance of life?